Right Advisory can provide transition CFO services and expert consultations in U.S. GAAP, COSO controls, XBRL, IFRS, SEC requirements and business reporting. Mr. Tarola has been personally involved with the financial reporting decisions of many companies, both national and global, in a variety of industries such as: manufacturing, investment management, higher education, health care, telecommunications, real estate, distribution and aerospace. Right Advisory principals will assume fiduciary obligations on behalf of a client. Right Advisory can provide management, oversight and consulting services for many corporate support functions including supply chain, information technology, HR, facilities, real estate, and others. Ms. Sarikas, who is a process improvement expert, and or network partners, have personally managed such functions. 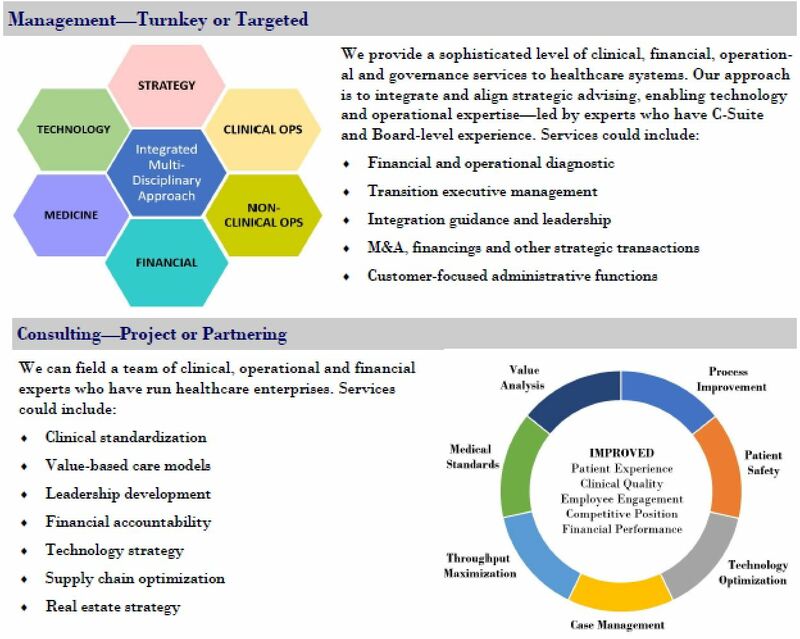 In healthcare, we can also add clinical operations, physician group management and strategic assessments to our offerings through our network partners. Right Advisory can provide turnaround and performance betterment services for healthcare providers in collaboration with its network partners. Please click here to access scope and menu of services that can be provided. Right Advisory can provide expert testimony and consultations in areas of: accounting and reporting, bankruptcy, finance operations, investor relations, transaction disputes and shareholder suits. Mr. Tarola is a credentialed expert with an extensive resume that can add credibility to case development, documentation and court proceedings. Right Advisory can provide expert support and consultations in all aspects of a troubled business situation – caused by business, liquidity or legal problems. Mr. Tarola, as the CFO during W. R. Grace’s voluntary bankruptcy proceeding from 2001 – 2008, has extensive direct experience with the financial requirements of Chapter 11. He can advise on how best to establish credibility with the court, creditors and shareholders, how to access DIP financing, and how to develop a turnaround plan. Right Advisory can provide expert guidance and advice on how best to assess and mitigate risk. As one of the first CFO’s to sign-off on Sarbanes-Oxley in 2002, and for each quarter through 2007, Mr. Tarola has extensive experience with the design, operations and assessment of control structures under COSO. He also has established an ERM framework following COSO guidelines. Right Advisory can provide training and consultations for auditors, finance professionals and MBA programs on how best to use the totality of corporate finance activities and processes to assess and mitigate risk. As a CFO for 17 years of large complex enterprises, audit committee chair and former audit partner, Mr. Tarola can show how the inter-relationships of all finance and business functions such as: accounting, treasury, investor relations, business planning, internal audit and financial systems, are used to track business activities and ensure sound information for decision making.